Festive Country Crock® Cookies with Confetti Sprinkles recipe is a great treat to bake for kids' birthday parties! For COOKIES, preheat oven to 375°. Beat Country Crock® Baking Sticks, granulated sugar, light brown sugar, eggs and vanilla in large bowl with electric mixer until creamy. Beat in flour, baking powder, salt and baking soda just until blended. Stir in 1/4 cup sprinkles. For GLAZE, stir confectioners sugar and warm water in medium bowl until smooth. 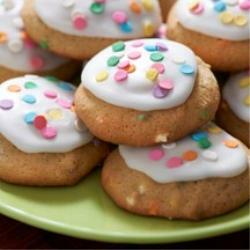 Spread over cooled cookies, then sprinkle with remaining 1/3 cup sprinkles. Let stand until glaze sets.